An urbane, soft-spoken former auto executive, Aldo Bozzi does not fit the mold of a driven Manhattan restaurateur — much less one who almost single-handedly, if inadvertently, set off a restaurant revolution in the United States and beyond. And Mezzaluna, his colorful and cacophonous little trattoria on the Upper East Side, hardly seems the setting for any kind of upheaval. Yet in a fresh and unassuming way, it introduced a style of modern Italian dining that still informs restaurants today, from Mario Batali’s new La Sirena in Manhattan to the much lauded Poggio Trattoria in Sausalito, Calif.
That kind of food was found in classic trattorias, which are ubiquitous today. But in 1984, when Mezzaluna opened, they were all but unknown in this country. 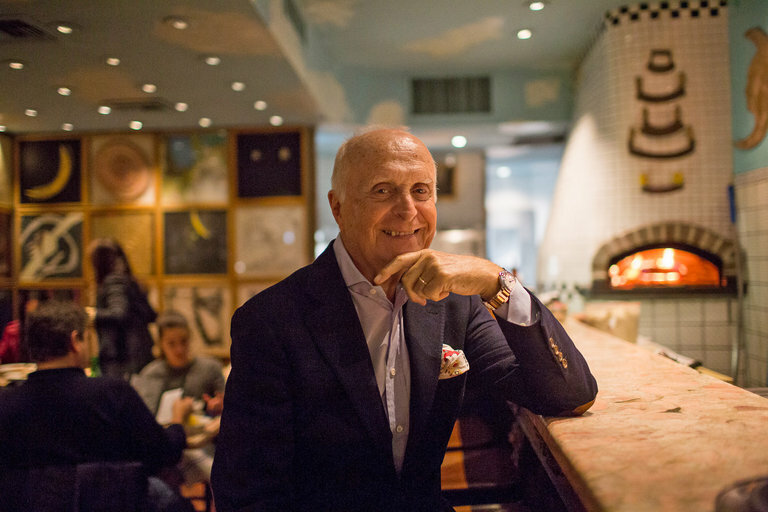 Aldo Bozzi at Mezzaluna, on the Upper East Side, which he opened in 1984. There I was baking my brains on the beach in one of the les chic Hamptons, when the first word reached me: Mezzaluna. Sharper than the sand fly’s sting came the communiqués from Western civilization: Mezzaluna. So even before I joined the far-from humble standees, chattering, ticking, and kiss-kissing to speed the 45-minute wait, I knew. Mezzaluna is the restaurant of the moment. Not “season”. Not “year”. I can safely track only “moment,” because the way fame strokes in this town, with half a dozen ambitious new eateries poised to open and vie for our favor, each one may be a star for fifteen minutes. Only the legends will survive the New Year. And what a glorious baptism for Mezzaluna. Sleek Italian sweetmeats sip peach-blushed champagne Bellinis, stretching and striding like the tawny lionesses they are. The belle donne are inAttenzione twosomes. Flighty Eurotwerps and their glorious muses, with great manes of jet black or the latest in little boy shearings, line up behind, and after them wait the pale, well-behaved Wasp affluents of the neighborhood and the lively tagtails that necessarily follow-and are already there. Why Mezzaluna? It is winsome. It is charming. It is clever. And modishly noisy. The menu offers no entrees, just antipasti (mostly salads), the paper-thin raw beef carpaccio with varying adornments, pasta, and pizza-trattoria fare with nuova cucina expletives, fast food (alas, at slow prices), sometimes wonderful, too often curiously bland. Mama Mia! A real trattoria […] Mezzaluna is a Florentine trattoria, which is a kind of restaurant that is hard to explain to Americans, and hard for some of us to appreciate. It is, as are Italians in general, extremely serious about food, design, art, fashion, friends, chaos and noise. […]Mezzaluna is so perfect a Florentine trattoria – in a whimsical, Milanese-modern “nuova cucina” way […] the place is […] a sight to see: everything is from Italy, from the bathroom doorknobs and facets to the 16th century Tuscan hutch near the door. The ceiling is painted sky-blue with white clouds. Floors are of the same terracotta tile as Brunelleschi’s dome on the cathedral in Florence. The tables are green streaked apricot marble. The china is Ginor. Mezzaluna means half moon, but it is also the name of the two-handled crescent-shaped Tuscan chopping knife that is the logo of the restaurant and the theme of the ambitious art display commissioned especially for the room . . . given the idea “mezzaluna” in Italian artists created amusing, serious, provocative and simply decorative paintings and collages which have been mounted like a mosaic on one entire wall of the restaurant. The menu is also creative. It starts with a clutch of mostly salad antipasti, all dressed with exquisite Tuscan olive oil. There is carpaccio (paper-thin-sliced raw beef) with various avant-garde toppings (like avocado), a page of pastas, a list of individual pizzas baked in a wood-burning oven […] the food then is great. Mezzaluna is the place to be […] Its cramped, narrow quarters provide New York with the closest thing to an Italian café and some highly engaging food […] the pastas and pizzas at Mezzluna […] are light and imaginative, after the fashion of nuova cucina. Mezzaluna is the first restaurant to open in the East 70s in the 80s that doesn’t make you suspect the food comes from a huge central kitchen under Third Avenue. […] Though barely twenty feet wide and twice as long, the restaurant manages to press forty diners around pink-veined marble tables […] But if you’re up for all this, it feels great […] Mezzaluna wants to please. The pizzas are bright and fresh, with a thin, slightly puffed crust. Euromania! Piccolo Café – The Italian influence of Florence’s Superstudio design team comes to New York’s Mezzaluna restaurant […] take one very small room about forty feet by eighteen. Squeeze in twenty three tables with twice as many seats and light it brilliantly right on the sidewalk. Be Italian and have lots of friends and perhaps you will be besieged with customers from your first five minutes […] Aldo Bozzi […] felt the need for a stylish, good food, drop in Italian restaurant […] he started with the graphics. Mario Mariotti, an artist in Florence, designed the Mezzaluna (half moon) logo. He coordinated a project in Florence with seventy-two artists each creating same-size pictures of a mezzaluna […] the project must have proved provocative because they got their very varied colorful pictures and Roberto Magris from Superstudio in Florence to frame them in identical frames and used them butted together, as his lively wall surface, covering his entire north wall […] tiles are used on the floor […] a brilliant sky painted on the ceiling, dozens of very small down lights […] Primavera marble for table tops and bar […] Ginori china and Alessi silverware […] a few antiques with a bar from a turn-of-the-century fabric shop . . a full pizza oven has also been fitted in […].